Auto-Sleepers have three Premium Packs available, the main, default standard Premium Pack and Winter Packs and an optional Media Pack. These popular packs tend to be everyone’s choice and models are usually built with at least the Premium and Winter Packs as an almost standard fitment. These packs are available with every model in the range although they may differ slightly for specific vehicles due to size or space available. Here at our Auto-Sleeper exhibition centre you can browse each model in the range, complete with at least the Premium and Winter Packs specific to that model; some will also have Media Packs fitted too. Many other features that we list below are either extras or options. For more information please feel free to contact our sales team. For 2019 model year, Auto-Sleepers have evolved and are now fitting the Sargent CAT6 tracker as a standard fitment to all models. Annual subscription, after initial customer registration is optional. Single-year, subscriptions are priced at £95. Owners may register and pay prior to collection via the Sargent website or at any time after collecting their new vehicle. 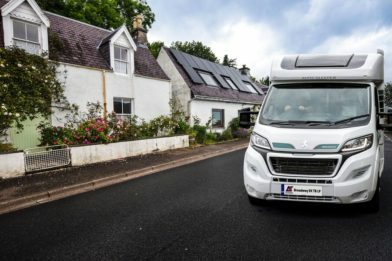 Alloy Wheels; Cab Air Conditioning; Cruise Control; Thule (Omnistor) Canopy Awning; Colour Reversing Camera and LCD screen; Peugeot DAB radio with integrated navigation; 80w solar panel. Mecatronic 65cm Automatic Satellite System with fully automatic tuning – receives transmissions. Astra 1, Astra 2, Astra 3 and Hotbird. Compatible with SD/HD free-to-air satellite receivers. Fresh and Waste Water Tank-Heater Blankets; Concertina Cab Blinds in lieu of cab curtains; Truma Combi 6kw heater upgrade; Wheel arch insulation blankets. Certain models with twin sofas may be available to order with an optional twin, forward facing travel seat featuring two, three-point seat belts in lieu of an off-side sofa. This option may not be possible to order on all models so please check with our sales team. A Luton-style over-cab bed offers additional sleeping accommodation for two people via a purpose-designed and approved roof extension pod. The low-line, standard roof is manufactured with either a large, opening sky view roof light or locker storage as desired. Opting for the Luton cab and bed means that there is no option for the sky-view window or locker. Currently there is no charge for this option. Peugeot customers who require an automatic transmission can elect to order a Fiat based model and chassis. This default option is available because Peugeot do not offer automatic transmission for their Boxer chassis. The Fiat comfortmatic option also has 2 engine power options and prices to choose from too; the first is a 130psi option at £2,000 including vat, the second a 150psi power option at £4,000 including vat. Customers ordering an automatic option should note though that the Fiat Comfortmatic option could have lead-in times that differ from standard Peugeot-based models. Continuing as a standard feature on each 2019, Mercedes based model is the very popular Truma roof-mounted, Air Conditioning system. Integrated into the Truma combi 6 heating system too, the unit also has a useful, additional 2kw electric built in heater too and when the air conditioning is operated, will allow full climate control, maintaining the pre-selected interior temperature. Customers who don’t wish to have habitation air conditioning are able to delete this at point of order and receive a saving of £1000 including vat. 7 Speed Fully Automatic Gearbox; Alloy Wheels; Cab Air Conditioning; Cruise Control, Thule (Omnistor) Canopy Awning; Colour Reversing Camera & LCD screen; Mercedes MBUX infotainment system with integrated navigation; 80w Solar Panel. This is included within the Mercedes Benz Premium Pack and no additional charge is made. The Winter Pack however consists of Fresh and Waste Water Tank-Heater Blankets; Concertina Cab Blinds in lieu of cab curtains; Truma Combi 6kw heater upgrade; Wheel arch insulation blankets. 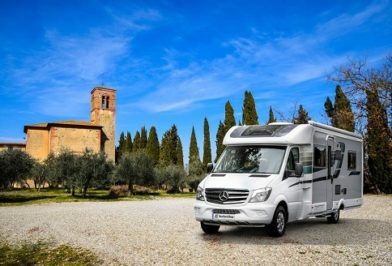 Mercedes-Benz Coachbuilt models are available with a choice of two roof options. The standard model is low-profile while there is the option for a Luton-style over-cab bed which offers additional sleeping accommodation for two people via a purpose-designed and approved roof extension pod. The low-line, standard roof is manufactured with either a large, opening sky view roof light or locker storage as desired. Opting for the Luton cab and bed means that there is no option for the sky-view window or locker. Currently there is no charge for this option. The Peugeot van conversion range continues again but with a new model added, the Symbol Plus and losing, this year, the Stanway model. Sargent’s CAT6 tracker becomes a standard-fitment to all models within the van range. Annual subscription, after initial customer registration is optional and Single-year subscriptions are priced at £95 p/a. Owners may register and pay prior to collection via the Sargent website or at any time after collecting their new vehicle. 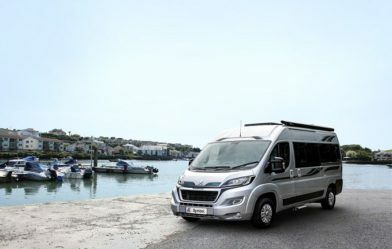 Alloy Wheels; Cab Air Conditioning; Cruise Control; Thule (Omnistor) Awning; Colour Reversing Camera & LCD screen; Peugeot DAB radio with integrated navigation; 80w Solar Panel, AL-KO Air Top Suspension. 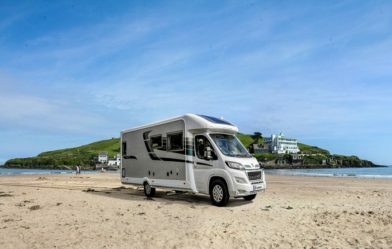 The ever-so-popular, large and luxurious Coriniums, FB, RB and Duo models remain for 2019. These coachbuilt models are Peugeot cabs and engines mated with Al-Ko’s very highly rated and popular chassis. Sargent’s CAT6 tracker becomes a standard-fitment to all models within the Al-Ko range. Models within the Corinium range may be available to order with optional twin, forward facing travel seating featuring two, three-point seat belts in lieu of an off-side sofa. This option may not be possible to order on all models and a chassis weight upgrade is required so please check with our sales team. 4000kg AL-KO Chassis up-grade (from 3500kg) designed to offer increased payload. Peugeot Al-Ko customers who require an automatic transmission can elect to order a Fiat based model. This default option is available because Peugeot do not offer automatic transmission for their Boxer model. The Fiat comfortmatic option has 2 engine power choices and prices; the first is a 130psi option at £2,000 including vat, the second a 150psi power option at £4,000 including vat. Customers ordering an automatic option should note though that the Fiat Comfortmatic option could have lead-in times that differ from standard Peugeot-based models and a chassis weight up-grade is recommended to compensate for the additional weight of the transmission and allows for a useable payload. All Auto-Sleeper motorhomes come with a choice of fabric patterns and colours; all are handpicked Belgian fabrics providing a luxurious finish. The Mercedes, Peugeot and Fiat coachbuilt ranges all feature Auto-Sleepers “Casa Mila” fabric. This is available in 5 different colours. The van conversion range features Auto-Sleepers’ “Sagrada fabric”, again available with 5 lovely colour choices. It is possible to order “Sagrada” for a coach-built model or “Casa Mila” for a van conversion; our sales team will be happy to advise but it should be noted that changes of this nature will increase lead-in times due to the bespoke nature of the build. Auto-Sleepers’ older, “Catalan” fabric is still available, although some colour options are becoming difficult to order as stocks are running low. Again, should any customer wish to order this, they should discuss their choice with our sales team, but lead-in times will be longer.